The overnight ratings showed a dramatic spike in viewership at 10 a.m. ET. Thursday, right when Ford's testimony began. Nearly 20% of US households with televisions were watching the hearings at any given time between 10 a.m. and 6:45 p.m., according to Nielsen ratings. That percentage is an average, which means an even greater number of homes watched some part of the proceedings. Between 10 and 6:45, Fox News averaged 5.66 million viewers at any given time, MSNBC averaged 2.83 million and CNN averaged 2.51 million viewers. All of those totals are two to three times higher than a typical day. CNN saw a bigger surge of young viewers than MSNBC did. In the 25- to 54-year-old demographic, CNN averaged 730,000 while MSNBC had 461,000. Fox News averaged 1.06 million. Interest remained high all day long, with a notable increase in the late afternoon and early evening hours when Kavanaugh defended himself amid questioning by Democratic senators. Viewership rose by several hundred thousand viewers each for CNN and MSNBC when Kavanaugh testified. At Fox News, where opinion hosts have been championing his nomination for months, the spike was more pronounced. 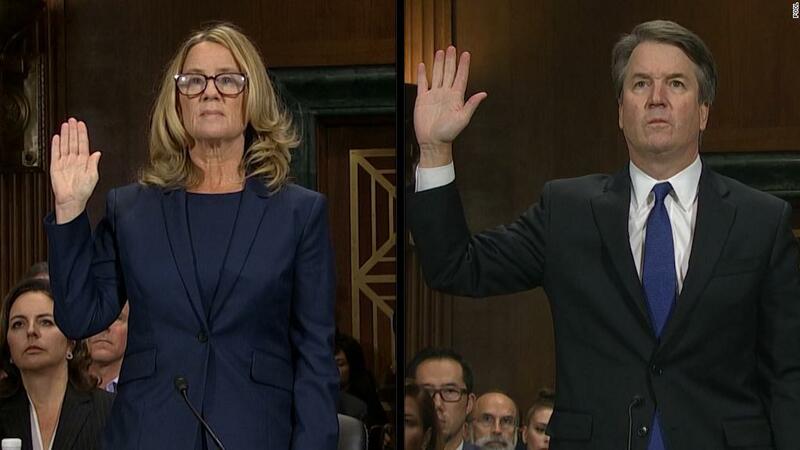 Fox averaged 4.69 million viewers during Ford's hours and 7.17 million during Kavanaugh's hours. The Senate hearing was also shown live on the NBC, ABC and CBS broadcast networks. Detailed ratings are not yet available for those networks. The Nielsen data only includes viewership via traditional TV. An untold number of others tuned in to the testimony through radio and streaming video, and at public viewing events. CBS News said that Thursday was the No. 1 day of the year for its digital channel, CBSN, in terms of live streams. And CNN said that Thursday was its biggest day of 2018 for digital video with 8.2 million plus live starts on its website and apps -- and more than 10 million including YouTube and Facebook streaming. It amounted to CNN's biggest live video day since the Trump inauguration, according to a network spokeswoman. There is no precise way to compare Thursday's viewership to the three days of hearings involving Clarence Thomas and Anita Hill in 1991 because there was only one cable news channel back then, and no internet. But reporters across the country described scenes reminiscent of 1991: People gathering around TV's in public places and catching parts of the hearings at work, at restaurants, and in airports.